Panoply’s integration with Cumul.io lets you easily add all of your data sources into your own secure, reliable smart data warehouse, and connect it to Cumul.io’s flexible visualization tool without writing a single line of code. Set up is super easy, you can do it on your own - no need for help from your IT or engineering team. With Panoply & Cumul.io, you’ll go from raw data to fast analytical dashboards without writing a single line of code. Simply upload any type of structured, unstructured and semi-structured data from all your different sources into Panoply in a few clicks. Panoply will automate the complex ETL process and organize your data into neat, easily readable tables! Then, you can seamlessly connect Panoply to Cumul.io to start building beautiful dashboards with simple drag & drop. By automating the whole process from data collection to visualization with Cumul.io and Panoply, you won’t waste time and budget on developing a reporting component yourself or managing databases to make them scale. Rather, you can focus on your core business analytics, customer engagement and lifecycle. You’ll be able to set up your data stack in minutes, in just a few clicks. Offer a beautiful, well-performing reporting module to your customers, inside your application. With automatic data modeling & query optimization, Panoply ensures a fast & seamless experience. 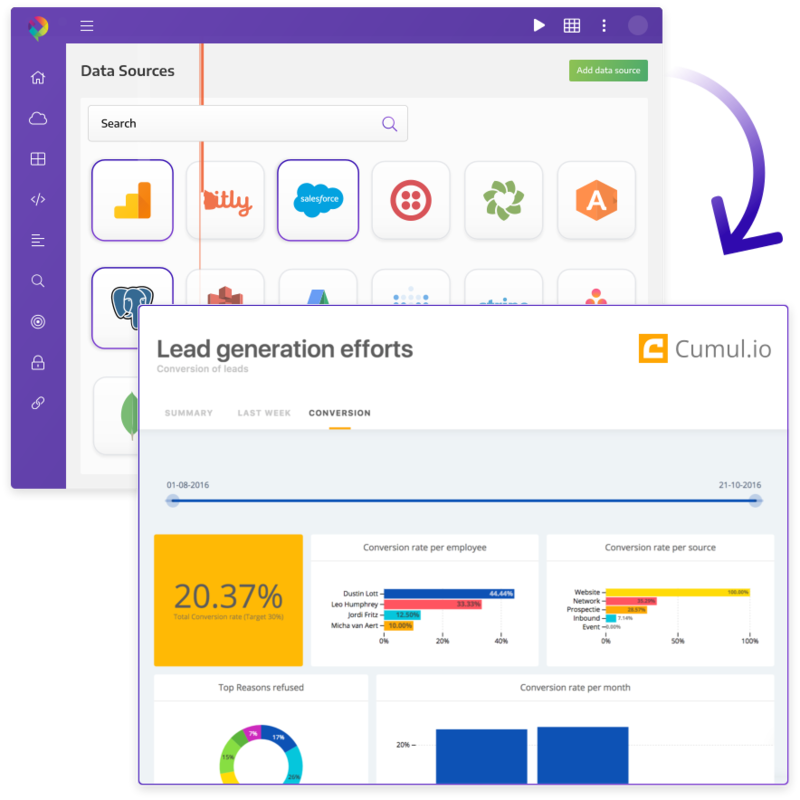 Cumul.io ensures seamlessly embedded dashboards in any environment: white-labeled analytics, optimized for all screen sizes and devices. Impress your customers with well-presented insights into their business.